The other day my bike was stolen right out of my house! It was a good one too - a one speed cruiser with super-wide handle bars, and man am I pissed. 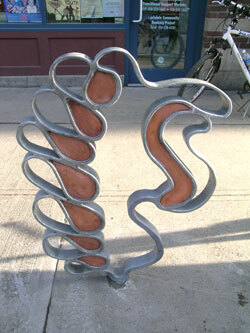 A series of sculptural installations that could have prevented this tragedy are now being installed around Parkdale. Councilor, Gord Perks was on hand Monday to unveil the newest one in front of the Parkdale Library. The Library's new sculpture, which looks like a bicycle inside of a large pair of reading glasses, is also intended as a bike rack. The installations add artistic flare to function and depict a wide variety of subject matter. One bike rack looks like a gargoyle, another looks like a Butterfly, there's a tree, a light bulb and many more. All the racks are designed by members of Parkdale Activity Recreation Center (PARC), a community centre offering support to psychiatric survivors and people who are socially isolated. Bridget Vianna, Chair of the Parkdale Liberty Economic Development Corporation, says "It has given our community members the ability to explore their creativity, beautify the local streetscape while serving a function by adding bicycle parking capacity to the area". Vianna and her organization are working with the Parkdale Village Business Improvement Area (PVBIA) and PARC to install these very unique bike racks. Ten additional racks are slated to be installed at the PVBIA offices on Queen Street West between Dufferin Street and Roncesvalles Avenue in the near future. In the meantime, if you see my stolen bike locked to any one of these, be sure to get in touch with me.